Ozhotels provides business and leisure travellers with a directory of independently owned and non-related hotels and serviced apartments providing accommodation in Parramatta. Oz hotels allows you to deal directly with the hotels and apartments in Sydney's West, therefore giving you the best possible rates for this Parramatta accommodation. Book your accommodation online directly with the hotels in Parramatta and receive discount rates for longer stays !!! Parramatta is a thriving precinct in Greater Western Sydney and is full of beautiful parks, historic sites, extensive shopping areas and a lively entertainment scene. The culturally diverse city of Parramatta has more than 150 restaurants and cafes that reflect Parramatta's ethinic mix and is also only a scenic 50 minute ferry ride from Circular Quay and the Sydney CBD. Parramatta played an important role in the shaping of Australia and many of the historic homes, museums and churches tell the story of the early settlers. 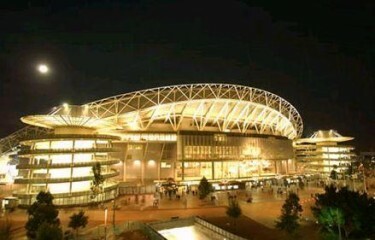 There are a range of Parramatta accommodation options available to guests who need to stay in this part of the city for business or want to be close to sporting arenas like the Telstra Olympic Stadium, Sydney Aquatic Centre, Rosehill Gardens Racecourse, ACER Arena, Superdome or Homebush Bay. 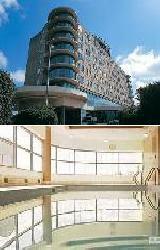 The Rydges Parramatta provides luxury hotel accomodation that is available at discount rates for longer stays. It is ideal for business, corporate, tourist and leisure travellers because it is close to Rosehill Gardens Racecourse, Homebush Bay Olympic Stadium and Sydney Showgrounds. 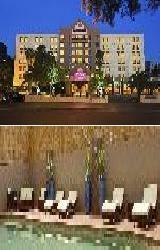 The Rydges Parramatta offers both holiday makers and business travellers the choice of discount hotel rooms and suites. 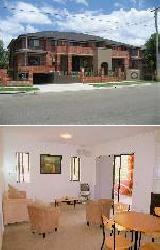 This Parramatta accommodation features modern amenities and is close to everything that the city has to offer. Rydges Parramatta is located in the heart of Western Sydney's thriving business region. 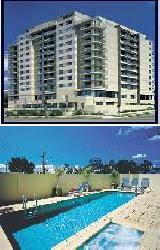 The Caulta Apartments in Parramatta, Sydney has furnished, self contained apartments at discount rates for short or long-term stays. 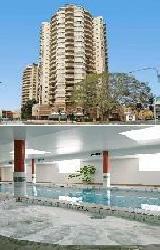 These Parramatta apartments are ideal for business travelers or vacation rent. The Caulta Apartments has a number of guests facilities and services including Free Car Parking which will make you feel right at home the next time that you stay. The Caulta Apartments provides furnished apartments are close to Riverside Theatre, Parramatta Stadium, Brislington Museum, Restaurants, Nightclubs, Pubs and Clubs. The Fiori Apartments Parramatta provides 1 & 2 bedroom self contained apartment accommodation in the heart of the Parramatta CBD that are ideal for business, leisure & corporate guests. With such a central location the Fiori Apartments is conveniently positioned so that guests can take advantage of some of the nearby local attractions. Enjoy all the facilities that Parramatta and the surrounding area has to offer including the Riverside Theatre, Sydney's famous Direct Factory Outlets (DFO) at Homebush, Paddy's Flemington markets, Rosehill Gardens Racecourse and Parramatta's business & shopping district. 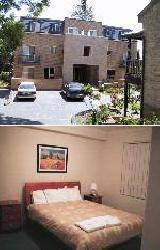 Fiori Apartments are ideal for business travellers or executives needing relocation accommodation. The studio and 1 bedroom apartments at the Parramatta Waldorf Apartment Hotel offers corporate, business and leisure travelers to Sydney's West luxury apartment accommodation at discount rates. The Waldorf Apartments offers great value apartment accommodation in Parramatta within easy walking distance to Parramatta's major shopping precinct, government offices, business and financial district. The Parramatta Waldorf Apartment Hotel is a prestigous and stylish accommodation property conviently located in the heart of Parramatta in Sydney's West. The 2 bedroom apartments at the Parkside Apartments in Parramatta provide affordable, discount accommodation for business executives and families close to the Parramtta city centre. The Parkside Apartments Parramatta has a number of guests facilities and services including Direct Internet Access, Free Car Parking, Guest Laundry and Airport Shuttle which will make you feel right at home the next time that you stay. Located 23 km west of Sydney Central Business District and within easy walking distance of the Parramatta Central Business District the Parkside Apartments is the ideal place to stay in Sydney for both business and leisure. The APX Apartments Parramatta (formerly known as the Quest Rosehill Apartments) provides luxury studios, 1 2 & 3 bedroom self contained serviced apartments. With such a central location the APX Apartments is conveniently positioned so that guests can take advantage of some of the nearby local attractions. 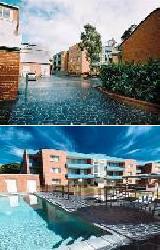 Walking distance to Roshill Gardens Race Course and Rosehill Exhibition and Conference Centre. Homebush Showground and Parramatta City Race Way only 5kms away and Elizabeth Farm and the fabulous Olympic precinct at Homebush Bay are just 6kms away. Westfield Parrmatta is only 2 kms for the best shopping in the west. Located opposite Rosehill Gardens Race Course, APX Apartments offers quality 1, 2 and 3 bedroom serviced apartments that are the perfect serviced accommodation for the business and leisure travellers. The Mantra Parramatta Apartments are just a two minute walk from the Parramatta Railway Station and Westfield Shopping Town, making it one of the best places to stay in Sydney's West. Designed and purpose built for the corporate and leisure markets, this luxuriously appointed new international hotel is located in the centre of Parramatta's business district. The quality guest facilities at the Mantra Apartments Parramatta include a heated outdoor pool, spa, gym, sauna, turkish bath, under cover parking, 24 hour reception, room service, guest laundry, conference room, restaurant & bar. 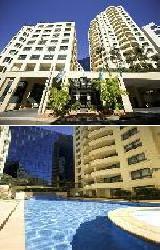 Novotel Sydney Parramatta provides luxury hotel accommodation in the Parrammatta CBD. This Greater Western Sydney property specialized in leisure & corporate accommodation and has big discounts for longer term stays. The Novotel Sydney Parramatta provides both holiday makers and business travellers with discount hotel rooms and suites. This Parramatta accommodation features modern amenities and is close to everything that the city has to offer including being just a 10 minutes stroll to Parramatta Train Station and Parramatta Stadium and a 10 minute drive to the Sydney Olympic Park. Recently refurbished the Clarion Hotel On The Park is idealy located in the heart of the Parramatta city centre amd close to the Westfield Shopping Centre, Parramatta Rail Interchange and only minutes from the Homebush Stadium. This fresh and contemporary styled luxury Parramatta hotel provides all types of travellers with discount accommodation in well equipped rooms. 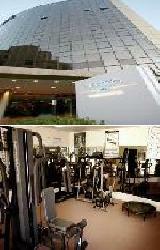 It also features a wide range of modern amenities and services such as lounge bar, business centre, conference centre, currency exchange services, disabled facilities, faxing facilities, guest laundry, fitness equipment, lift, restaurant, room service, spa, outdoor swimming pool, 24 hour reception, baby cots available and daily housekeeping.